Beginning his musical journey at age 11, Rahul dedicated himself to studying the classical guitar after being inspired by the performance of a local teacher. Setting his sights on refining his technique and improving as a musician, he has studied with some of the world’s finest teachers at USC, UCSB, and SFSU and has participated in several masterclasses and competitions. 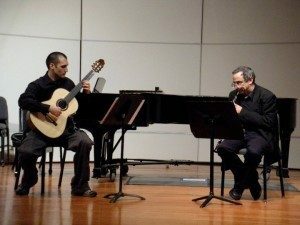 Graduating with a bachelor’s of music in classical guitar performance, Rahul has performed in several ensembles and premiered pieces by students and teachers alike. Teaching out of his home studio in Studio City, Rahul teaches students of all ages and skill levels. In his strife to be a well-rounded individual, he also holds a degree in psychology, enjoys painting, exercising, and close-up magic in addition to teaching and performing music. We are honored to have Rahul as an instructor at Los Angeles Guitar Academy. To request guitar lessons with Rahul Puar, please fill out our pre-registration form, selecting him as your teacher preference.